Born to a pious, powerful Thuringian noble family; her older sister was a nun. Convent-educated from age seven, Mechtilde became a nun at Rodersdorf, Switzerland. She moved to the Helfta monastery in 1258 where her sister served as abbess. Teacher and choir director at the convent school at Helfta. Visionary and mystic. Novice mistress for Saint Gertrude the Great who wrote The Book of Special Grace about Mechtilde's teachings; she was initially terrified that the book might cause trouble, but Christ appeared to her in prayer and told her not to worry. She became a much sought spiritual advisor to her sister nuns, laity and learned Dominicans. May have been the inspiration for the character Matelda in Dante's Purgatorio. Daughter of Prince Eormenred of Kent, England; grand-daughter of King Edbald. Sister of Saint Ermengitha, Saint Etheldreda, Saint Ethelred, and Saint Ethelbert of Eastry. Married to King Merewalh of Magonset. Mother of Saint Mildred of Thanet, Saint Milburga, and Saint Milgitha, and a son named Merefin who died very young. In 664, Ebbe's cousin Egbert ascended to the throne of Kent. Worried about claims to the crown by Ethelred and Ethelbert, Egbert had them murdered. He later repented of the crime, and offered Queen Ebbe compensation for the loss (weregild). Ebbe chose a gift of as much land as her tame doe could run around in one course; the king agreed, and the Isle of Thanet was chosen as the site. The king's advisor, Thunor, who had recommended the murders, accused Ebbe of witchcraft, mounted his horse, and set off in pursuit of the doe; the earth promptly opened and swallowed him. The doe circled a large plot of land, which became the site of the monastery of Minster-on-Thanet, dedicated to the Blessed Virgin; today the area is known as Ebbsfleet in memory of Ebbe. On the death of King Merewalh in 673, Ebbe entered the convent as its first abbess. Dominican at Mantua, Italy in 1290. Doctor of theology. Priest. Friend and brother friar with Nicholas Boccasino who later became Pope Benedict XI, and for whom James held several support offices including papal legate. Bishop of Mantua in 1303. Noted for his devotion to the poor, and his care for the sick during a plague epidemic. Rebuilt his cathedral and refurbished churches. Papal legate for Pope John XXII. Uneducated Christian peasant. Jailed for his faith during the persecution of Diocletian. Brought to trial in 304, he was scourged, racked, tortured, and ordered to deny his faith; he refused. In an effort to make it look as though Barlaam were making an incense offering to an idol, the judge had the prisoner's hand covered in incense, then held over the coals of a brazier. He thought that when Barlaam flinched from the pain, the incense would fall in the fire, he could declare that Barlaam had made sacrifice, and he could be turned loose as an example. Instead, Barlaam never flinched. When his entire hand had burned off, the judge gave up and had him murdered. Martyr. Tenth century monk in Calabria, Italy. Abbot. He travelled to North Africa to obtain the relesae of some monks held captive by Muslims, he was captured himself. When the Saracens demanded that the Christian prisoners renounce their faith; when they refused, the captors prepared to beat them – and became paralyzed. 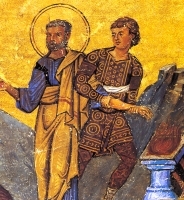 Simon healed them with a prayer, and he and his brother monks were released. Late in life, Simon left his monastery to live as a hermit on Mount Mercury in Calabria. Deaf layman in the archdiocese of Barcelona, Spain. Member of the Salesian Cooperators whom he considered his family. Skiled sculptor. Martyred in the Spanish Civil War. Member of the Salesians of Don Bosco, joining in 1932. Martyred in the Spanish Civil War. Old Testament prophet whose writings are dated between the 9th and 5th centuries before Christ. Outside of the text, which announces the punishment of the enemies of Israel, nothing is known about him. Educated at Cappadocia. Married a princess of the Mamikonian family. Father of Saint Isaac the Great. Catholicos in 353. When some of his proposed reforms displeased King Arshak III, Nerses was exiled until recalled in 369 by King Pap - who murdered him by poisoning 4 years later. Army officer, he travelled extensively. He was eventually assigned to Gaul where he retired. Priest at Clermont, France. Benedictine monk at Bourges, France. Hermit at Sasseau, France. Benedictine monk. First Abbot of Tordino Abbey near Teramo, Italy in 1004. Monk and then abbot in the area of Le Puy, Aquitaine (in modern France). Priest. Martyred in the persecutions of Valerian. One of about 150 Christian soldiers martyred together in the persecutions of Diocletian. Martyred in the persecutions of Marcus Aurelius. Eighth century consecrated virgin who lived most of her life in the area of Galloway, Scotland. Founded Ottobeuren Abbey in Ottobeuren, Germany in 764. Forty women, a mix of nuns, widows and other lay women, who were martyred together. No other details have come down to us.